There is more to reindeers than Rudolph and his nose! 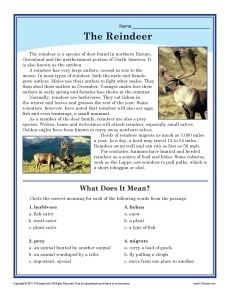 Your student will read about this iconic Christmas animal in this worksheet. He’ll also determine the meaning of words in the passage through a short exercise. It’s good practice for 5th grade Common Core Standards for Craft and Structure. Other grades may also use it as needed.